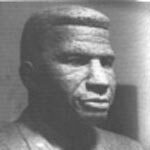 March 28, 1925 Ed Wilson, sculptor, was born in Baltimore, Maryland. After serving in the United States Army from 1943 to 1946, Wilson earned his Master of Arts degree from the University of Iowa in 1953. Wilson’s involvement in the Civil Rights Movement is apparent in such works as “Minority Man” (1957). In 1964, Wilson accepted a position at Harpur College of the State University of New York and was soon after made chairman of the college’s department of art and art history. Wilson worked primarily on civic commissions therefore his works were generally not displayed in museums, but in public spaces. His works include the “JFK Memorial Park” (1969), “Second Genesis” (1971), and “Portrait of Ralph Ellison” (1975). Wilson died November 26, 1996.